"School Days With A Pig"
Based on a true story, this film is an emotional masterpiece based on a true controversial story that swept across Japan. 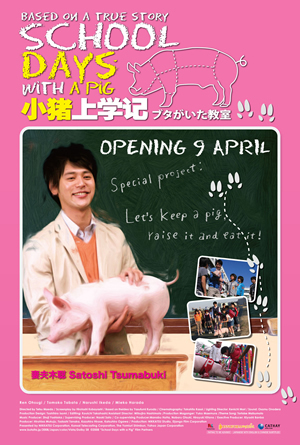 A rookie primary school teacher (Satoshi Tsumabuki) suggests his students that they raise a pig, as a way to teach “the real connection between life and food.” He further proposes to eat the pig when it is fully grown. The deadline will be their graduation. The class gets a piglet together, and decides to take care of it in rotation. 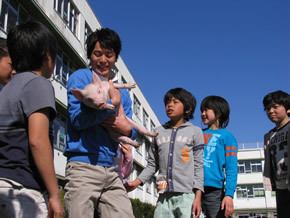 The students decide to name the piglet “P-chan”. Hesitant to take care of the P-chan at first, it wasn’t long before the students begin to cherish it. "School Days with a Pig" is one of those contemplative and poignant films that should be heavily marketed at Students, Teachers and Parents. This is one movie that invites discussion and pondering about simple things in life that we take for granted. (But please kindly do it after the movie had ended!). As the synopsis pointed out, it’s based upon a true life incident about a young school teacher asking his primary school students to raise a pig during their final graduation year. The simple plan was to teach them 'the real connection between life and food' and eventually eating the pig at the end of the graduation year. It’s a simple plan with good intention but just like the road to hell is paved with good intention, the young school teacher soon found that instead of teaching the kids a lesson, he himself had learn a difficult profound lesson in life. It felt like he had open the Pandora’s Box and created a lot of unnecessary grief to all those who are directly (the kids and him) and indirectly involved (the parents, the other teachers and even the principal). But like the tale of the Pandora’s Box, it also offered hope in the end and those who are involved would have gain a richer perspective in life. It might have been a very difficult lesson to teach and learn but if more children had gone through similar lesson and learn to consider about the multiple factors before making a decision on the fate of another life, the world would be a much peaceful place to live in. This teacher’s unorthodox choice of teaching his kids a lesson in life is another good issue for teachers to ponder upon. While it’s likely that the teacher would not be able to repeat such project with his next batch of kids, it’s good to consider about his intention in educating the next generation on matters beyond the classroom syllabus. It might be extra work but it could be an enriching experience to both the children and teachers that money could never buy. The children in this movie are also a surprise factor in this movie. Granted that their dialogues might have been scripted but it does make one wonder about the range of reasoning that a primary school kid is capable after immersing oneself to the project. It seeks to debunk the incorrect old adage that 'a child should be seen and not heard' by letting the children speak their minds about this unique project. Listening and watching these cutesy children pour out their thoughts and emotions about the fate of the pig were not only enlightening to absorb, it was also heart wrenching to watch. On one hand, it felt too cruel to put them through such difficult choice about life in their formative years but on the other hand, one also realize that they would have gone through a very meaningful experience in life that few would ever experience in their life. However this movie isn’t without it’s flaws. The character and events development in this movie was incredibly fluffy. It never really went in depth about the young teacher or what made him decide to carry this project with the kids. 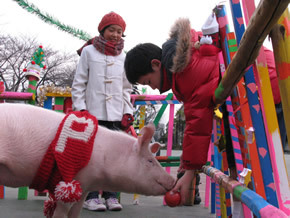 The attention spent on focusing the kids’ relationship with the pig was rather uneventful and was done in an overly cutesy joyful manner that seemly fast forwarded all the difficulties in raising a pet. Some of the issues that the kids brought up felt repetitive and in some ways, it felt like the movie is running in circle before coming to a conclusion. Those are some of the minor faults of an otherwise perfect movie to educate both the children and their caretakers about the value of life. It’s contemplative and although it does points out certain views, it also left some banks for the viewers to fill in. It’s also an inspiring piece of work for those who are involved with educating the next generation. Last but not least, the kids in this movie will be tugging your hearts strings with their adorableness and their viewpoint in this project. "School Days with a Pig" should not be missed.